It was the perfect way for the Wallabies to start their Rugby Championship, while despite their resolute defending South Africa simply conceded too many penalties. 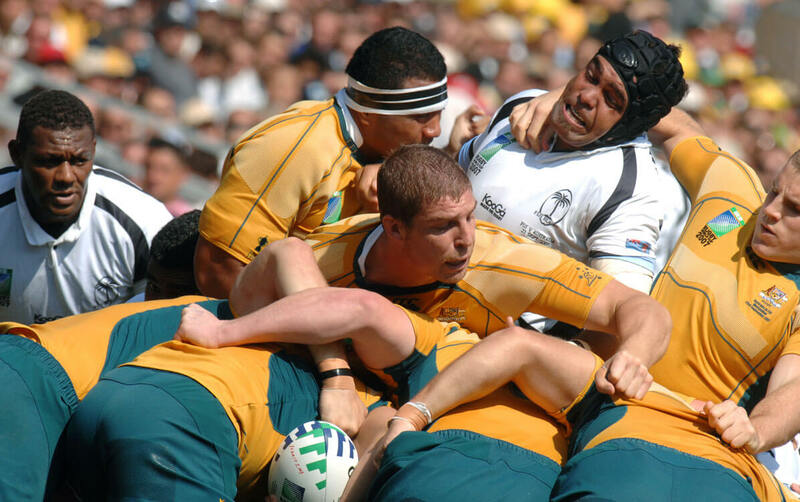 Nevertheless Australia, who were roared on by a crowd of 37,000 at the Suncorp Stadium, did amazingly well with some great free-flowing rugby in the later stages of the game. Kuridrani the became the hero after his try was awarded by the television match official by the slenderest of margins. And it was fitting on the day that Matt Giteau, who made his return to test rugby after four years, would convert the final try to bring down the curtain on what was an enthralling game of rugby. The Springboks two tries came from Eben Etzebeth and debutant Jesse Kriel, while Australia’s other two scores came from Adam Ashley-Cooper and Michael Hooper. After two early penalty misses 21-year old fly-half Handre Pollard refound his composure to kick a pair of kicks to give the South Africa a six point lead. Australia however opened the try scoring just after the half hour when Ashley-Cooper scythed through the Boks defence for his 31st test try. Quade Cooper converted to edge the Wallabies narrowly in front, 7-6. But South Africa replied through Eztebeth, who just before the break powered his way over in the corner. Pollard added the conversion via the upright to give the Springboks a four point lead at the half-time, 7-11. After the break South Africa flew out of the traps with outside centre Kriel leaving three Aussie defenders for dead to touch down in the corner. And again Pollard converted to open up a thirteen-point lead. Cooper managed to add another three points from the tee to close the gap to ten points, but South Africa were still very much in control heading into the final 20 minutes. Then with seven minutes to go momentum swung as Hooper crashed over from close range for his 8th test try, with Cooper converted to cut South Africa’s once convincing lead to just three points. Giteau then had an attempt to level the game from 40m drop short. But the Wallabies battled on and two minutes after the 80 Kuridrani appeared to touch down. It was referred upstairs, and ended in Australian celebrations as the try was awarded. And Giteau added the extras to wrap up the comeback victory. It may be four years since Matt Giteau played test rugby but from this performance you would not have been able to tell. The vastly experienced 32-year old showed great composure and flashes of skill throughout. Therefore did himself no harm in staking a claim to be among Australia’s World Cup squad. Australia: 15 Israel Folau, 14 Adam Ashley-Cooper, 13 Tevita Kuridrani, 12 Matt Giteau, 11 Rob Horne, 10 Quade Cooper, 9 Will Genia, 8 Scott Higginbotham, 7 Michael Hooper, 6 Scott Fardy, 5 Rob Simmons, 4 Will Skelton, 3 Sekope Kepu, 2 Stephen Moore (c), 1 James Slipper.Replacements: 16 Tatafu Polota-Nau, 17 Scott Sio, 18 Greg Holmes, 19 James Horwill, 20 David Pocock, 21 Nick Phipps, 22 Matt Toomua, 23 Drew Mitchell. South Africa: 15 Willie le Roux, 14 JP Pietersen, 13 Jesse Kriel, 12 Damian de Allende, 11 Bryan Habana, 10 Handré Pollard, 9 Ruan Pienaar, 8 Schalk Burger, 7 Marcell Coetzee, 6 Francois Louw, 5 Victor Matfield (captain), 4 Eben Etzebeth, 3 Jannie du Plessis, 2 Bismarck du Plessis, 1 Tendai Mtawarira.Replacements:16 Adriaan Strauss, 17 Heinke van der Merwe, 18 Frans Malherbe, 19 Lodewyk de Jager, 20 Teboho Mohoje, 21 Cobus Reinach, 22 Pat Lambie, 23 Lwazi Mvovo.